The M*A*S*H TV show was a 30 minute comedy series on CBS about a unit of doctors and nurses who had been torn from their personal lives and thrown into a muddy, bug infested camp in the middle of the Korean war! Most of them didn't want to be there. Their careers had just been "taking off" after years of medical education and training and now their rewards were being denied them. But when they heard the "choppers" coming in with wounded soldiers, all that was forgotten. They became the only hope close enough to the fighting to help the injured. When their work was done, they could go back to their drinking and complaining and sometimes romance in an effort to forget their miserable plight. This TV series did the impossible. It somehow found a way to be a comedy with a very non-comical premise. Most of the comedy revolved around the "draftees" pulling practical jokes on the career military personnel. Do you remember the signpost on M*A*S*H? It pointed to between nine and eleven different locations during the show's run. The nine were Boston, Seoul, Coney Island, San Francisco, Tokyo, Burbank, Death Valley, Toledo and Decatur. At some point Honolulu was added and for some reason, another Seoul was added so there was one near the top and another at the bottom. ...and you can do the same thing if you choose. The Complete Series + Movie! 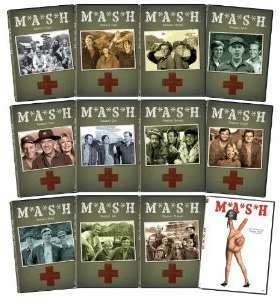 Thank you for visiting our M*A*S*H TV show page!